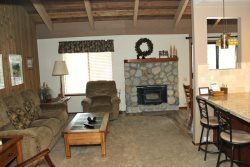 2 Bedroom & Loft & 2 Bath town-home located in the heart of Mammoth Lakes on the red line shuttle and near the Sierra Star Golf Course. Sleeps up to 8. The master bedroom has 1 queen bed, the second bedroom has two twin beds, the loft has 2 sets of bunk beds. No sofa bed in Living Room. New dining room set. 3 TVs (42 inch flat screen in the Living Room & flat screen in first bedroom. Flat Screen T.V. in master bedroom, DVD, Stereo/CD. Phone in unit 760-934-1437 (1341 Sq. Ft.). Wireless Internet provided through Verizon. This is a 3 level town-home with the entrance on the first floor. The first floor is both bedrooms and 1 full bath, the second floor is the living room, kitchen, dining room and 2nd full bath, and the third floor is the loft which is open in to the living room by a half wall. There are two outside parking spaces available. Nice unit with a partial view of the top of the Sherwin Mountain Range. Spa, Seasonal/ Summer Swimming Pool, and Sauna. Coin-operated laundry facilities located in the common area near the office. COMPLIMENTARY INTERNET and CABLE TV are provided, however NO REFUNDS will be given for connectivity problems or Internet failure. TOT LICENSE 3390-WL30. This place is great if youre with a small group of friends or even a family. There was lots of room and it was super close to eagle and canyon lodge, so you have a choice between driving or taking a shuttle. I will definitely keep this place in mind for the next trip out there! Quiet location with plenty of amenities. Thank you so much for letting us rent the space. It was a beautiful condo! Great location, spacious, and clean! The place comfortably slept a group and was very close to the mountain-about a 5min drive from Eagle Lodge. It was also a great location for getting to town, restaurants, and bars. As usual we had a great time in Mammoth on our annual fishing trip and everything was good at the Woodlands. The place was great to stay very comfy close to the village..hope we can go back again..
Great place lots of space quiet and comfortable. This place is awesome and super close to everything will definitely be coming back again in the near future! Thanks for everything you guys rock! This condo is perfect for any kind of trip! Its centrally located, spacious enough that 6-8 people can stay in the condo and not feel like they are sleeping on top of one another and the complex was perfect! This is a great place to stay with family and friends. This was the perfect condo, tons of space, close to the bus stop really everything about this condo was perfect. I cant wait to come back! Thank you. The St. Margarets cross country team had a fantastic time in Mammoth Lakes this past week. The condos worked out great. We are looking forward to next summer.